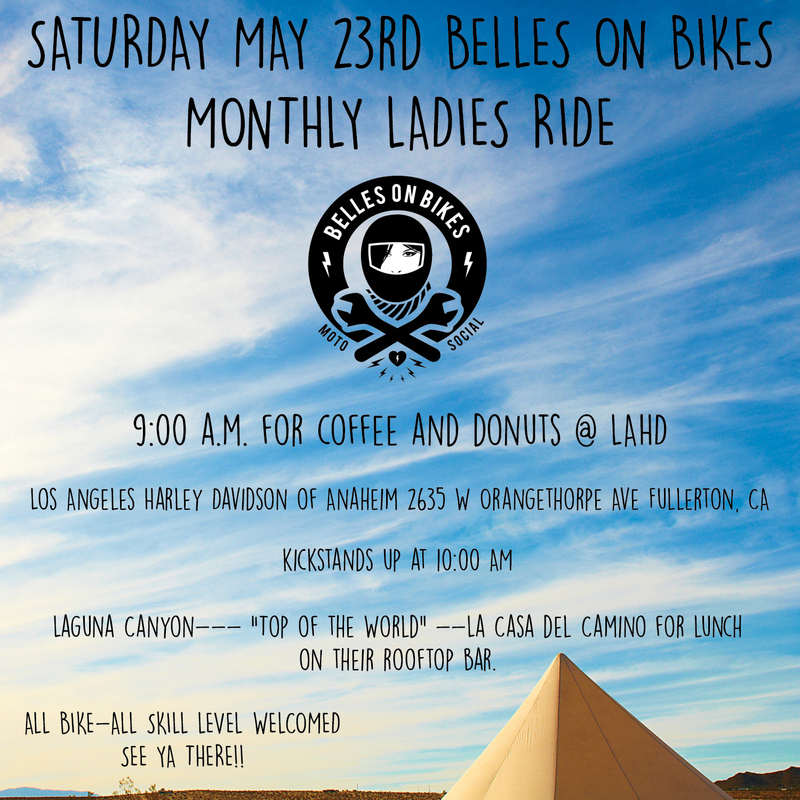 Belles On Bikes monthly ladies ride will meet at LAHD at 9:00 a.m. for coffee and donuts. Please arrive with a full tank, we’ll have a quick safety meeting then kickstands up at 10:00. We will ride down through Laguna Canyon and make a stop at the scenic “Top of the World” in Laguna Beach. After that stop we will ride to La Casa del Camino for lunch on their rooftop bar. This entry was posted in America, babesonbikes, CA, Camping, Harley Davidson, MC, moto, moto adventures, Motorcycle, Motorcycle Club, Photography, Uncategorized and tagged babes Ride out, belles on bikes, Belles On Bikes Moto Social, Flat Black Collection, Harley Davidson, Moto, Motorcycle, Photography, Presidential weekend, Socal Sirens, Venice Vixens on May 14, 2015 by Belles On Bikes Social Club.